Home » Texas Rangers » What this team needed. 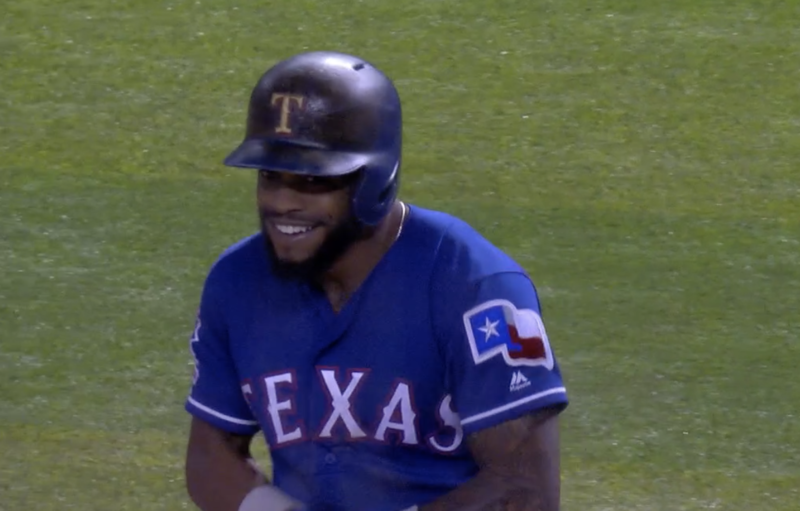 Delino DeShields is all smiles after his second hit of the game drove in the Rangers second run of the game, and gave his team a lead in a game they would win 5-2. What this team needs: Delino DeShields playing like the promise of Delino DeShields. 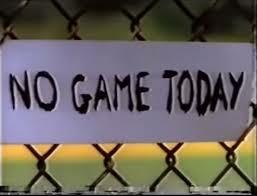 What this team doesn’t need: Jose Leclerc playing like the ghost of Tanner Scheppers. Both extremes were on display last night. 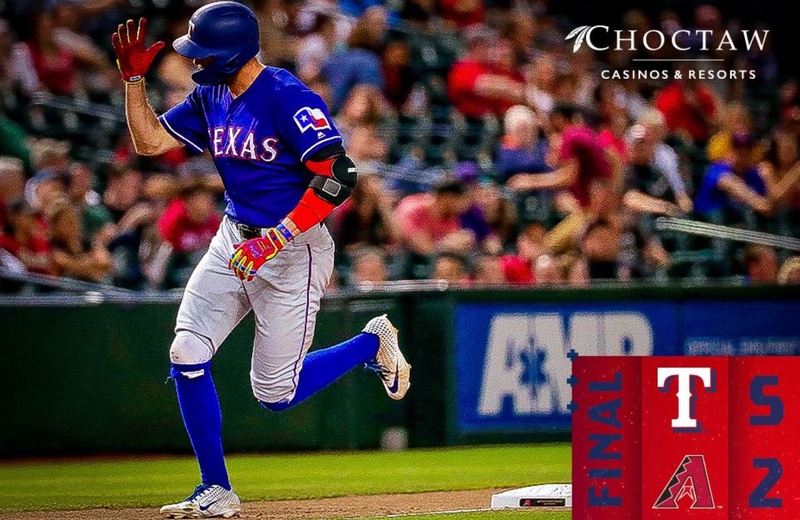 Luckily the DeShields overshadowed the Leclerc and the Rangers were able to split the two-game series with the Diamondback, get back to .500 after twelve games (they were 4-8 at this juncture last year), salvage a bad road trip, snap a four-game losing streak, and head back home with a little positivity. But also head back home with a major question hanging over their heads: what’s wrong with Leclerc? But, first, DeShields. When Delino DeShields is right, he is a spark plug. He is a catalyst for the offense. The challenge is getting him right and keeping him there. He came into last night’s game batting .100. Which is why he has mostly been batting at the bottom of the order. Sure, he has speed. But what good does that do if he can’t get on base to use it? It’s like having a Porche on LBJ at rush hour. It goes 10 miles per hour just as fast as a Prius. DeShields’s hit in the sixth inning was the Rangers first of the night. Almost immediately, he stole second, and took third on a throwing error. That was the disruptive power of DeShields that Rangers offense needs. Speed can rattle. Logan Forsythe singled DeShields in and the Rangers tied the game. DeShields hit a single in the seventh to drive in the second run. The Rangers offense clicks when DeShields clicks. Hopefully last night was the start of a lot of clicking. And hopefully last night was the end of a lot of palpitating. With a 5-1 lead heading into the bottom of the ninth, so it was no longer a save situation, manager Chris Woodward made a smart decision. Give Jose Leclerc the ball and let him gain a measure of redemption from Tuesday night’s blown save. A closer has to be able to come back from that. Leclerc faced five batters. Single, hit by pitch, hit by pitch, pop up behind the plate, walk. Run scored. Bases loaded. Manager Chris Woodward then made a second smart move. Take the ball away from Jose Leclerc. Don’t let this thing take root in Leclerc’s head. Don’t let him blow another save. Don’t lose this game. Because what this team needed more than anything else was to not let last night’s game get away. Yes, what they needed was a win. What they didn’t need was for LeClerc to blow up. Fortunately there’s an off day today so they can work on it. He was clearly overthrowing his pitches. Alas, the heads of relief pitchers. Lynn pitched a nice game, that was good to see. Now that he’s showed us that he can do it he needs to repeat. I took a quick look at Seattle to see why they are doing what they are doing. Pretty simple, they are scoring a crap load of runs, right at 8 per game. They’ve hit 33 HR’s and batting .294 as a team. Pretty doubtful if that is sustainable for very long. While doing that I discovered that the DH does not necessarily result in more offence. Example, Seattle tops the list of runs scored per game. the next six teams are all in the NL, while Minnesota is number 8. Baseball, Go Figure!!! In 2015 and 2017 DD used to hit a lot of doubles and triples but last year and so far this year he’s lost that ability and has mostly stopped hitting line drives. Last year his hand injuries probably had a lot to do with it. Hopefully he’s over that and is just being bothered by his slow start. Early in ST Woodward was quoted as saying he wanted DD to adjust his swing to aim for line drives instead of ground balls as Banny wanted. I thought that was good advice and took it to mean they’d let him swing more instead of always taking pitches until he got two strikes. Everyone’s BA plunges when they hit with two strikes. But so far he’s still kept doing that. Sometimes it leads to a walk and he has a bunch of those but it’s killing his hitting. Maybe he turned a corner last night. Whatever mind games he’s playing on himself don’t seem to be affecting his defense, which so far has been excellent. His throwing has been much better and they don’t run on him anymore. That’s partly because he gets rid of the ball very quickly. Sometimes last year that led him to overrun ground balls and let them go to the wall but hopefully he’s learned to stop doing that. Probably the easiest thing for an OFer to fix. With Leclerc I’m hopeful that it’s just that on Tuesday he was rusty from lack of use and then yesterday he lacked confidence because of what happened Tuesday. I agree that it was the right move to bring him right back and also the right move to yank him when he was struggling again. He hasn’t been overused (so far at least) so I’m hopeful it’s not an injury situation. Love the fact that Woodward let Lynn throw 111 pitches. We don’t seem to have a robot manager anymore. Don’t know what you see in DDs arm……its atrocious. He doesn’t have a strong arm; but he gets the ball to the cut man quickly. His defense have improve from what we saw 2 years ago. He does get rid of the ball quickly and he’s learned to throw on a low plane. He may also have built up some muscles that relate to throwing. Mike Trout did all those things after being called “weak-armed” when he first came up and he’s now pretty good. It can be done and according to Hunter Pence and others DD is a very hard worker. Beginning early last year baserunners stopped taking an extra base off him. He’ll never have the kind of arm that inspires gasps of awe like Gallo has. But if you’ve noticed Gallo has made a couple of costly bad throws this season and DD hasn’t made any. Great OF arms are fun to watch but as far as impact on the game is concerned they’re overrated. Not picking at you–I wouldn’t, except in jest. But he never did say DD’s arm was strong. He said he got rid of the ball quickly. I was reading in yesterday’s piece during the game when you mentioned a cruise. The artist that caught my attention the most was Dave Mason. As a fan of Traffic since my youth I can tell you just about anything about them. It’s a shame that Winwood and Mason could not get along, but with hindsight we see that Winwood had the right idea. I liked Mason. His 1st two solo albums(Alone Together and It’s Like You Never Left) were excellent. After that, no great albums, but some good ones. I saw him several times in mid-70’s and he was very good. Winwood is the one I followed moreso–with and without Traffic. Saw Traffic in ’74. Winwood in ’86. Then I was privileged to see him and Clapton in MSG when they did three historic shows. It’s been about 11 years ago now. It was like a Blind Faith reunion. One of the best of well over a hundred major shows I have seen. They released a live DVD/CD from those shows. It is quite good. They played just about every song on the Blind Faith album, plus each other’s songs and a variety of tunes they both liked. A highlight was Hendrix’s Little Wing and Voodoo Chile back to back–awesome. Curious–Kevin sometime within the last week or so your posts are IDed by a different moderator symbol. Looks nice. When did you change it and why, if you don’t mind my asking? Did you design it? That’s probably a stupid question, since I am sure that you did. I changed it a few days ago. I was going to change it before the season but when I got back from Iceland, I forgot. Not sure why I changed it. I guess I just felt it was better to identify myself as the one behind the site on my posts. The logo was designed by a couple friends who are really good designers, David Soames and Dustin Taylor. I used to work with them. Well they did a nice job. It looks good. It’s like when you get a haircut–I like it if someone(preferably an attractive lady) notices. You can take it as a compliment that I noticed. Also, you can tell your friends that at least one reader(and I am sure many more) who thinks that they did a fine job. Whew–that was close. If Wisdom had not speared that bullet down 1B line, I there would have been 2 BS in a row and probably a running 5 game losing streak. Leclerc has lost something–hope it’s not due to injury, but lost confidence can be equally bad for a closer. Woodward was given the opportunity needed to help Leclerc right himself: non-save situation in B 9th. Then he pitched his way into a save situation for the next guy. Leclerc is needed at his best. Unlike the last few years, there are no other obvious options as closer. I think it’s best to have one guy have the job instead of whomever the manager “feels” can get it done. But you can’t let a guy lose a bunch of games until he “gets things right.” Right now, I don’t trust him. Certainly not with just a 1 run lead. What to do? I know that Woodward will put him out there in the next save situation–he has to. But I don’t look forward to it. Kevin you are right about placing the emphasis on DD. The guy can be so valuable to this team—if he gets on base. Defensively, he is an always an asset. If he gets it going, the Rangers will win. I’m starting to get more than a bit concerned about Odor. What gives? Any clues? I think that was Forsythe who caught that. right. I wasn’t watching, I had read and did not remember. The man saved the game. I don’t expect much of him. I do, however, love how excited everyone gets when one of these players has a good game, as if this is it, this is the moment they turn it around, all that hard work is going to pay off, he’s been hitting the ball so well with nothing to show for it. I’d like to find a guy who isn’t hitting the ball so well but has a lot to show for it. Right on. Fans tend to get over hyped, especially with latest prospect. They all jump on the bandwagon and then are disappointed when the guy fails to meet their expectations. It’s an easy trap to fall info; as I speak to you with one leg firmly ensconced in said trap. Actually, I was talking about the post-game broadcasters and the manager. They were so excited for DeShields. I was like, okay, it’s one game. Let’s see him do that over an extended period of time. Gotcha …. I’m still stuck in the trap. I was very disappointed with Gallo last night. He was definitely not the Gallo we’ve seen the first 8 games of the season. This game could have been a 10 run game for Texas if he would have shown more patience at the plate. He’s never going to be Michael Young. He’s never going to be a contact hitter. He’s always going to swing for the fences. 40 times a year he will be successful. Another 50 times he will miss hit the ball for a hit. 200 times he will miss it totally. The rest of the time he will hit into an out. 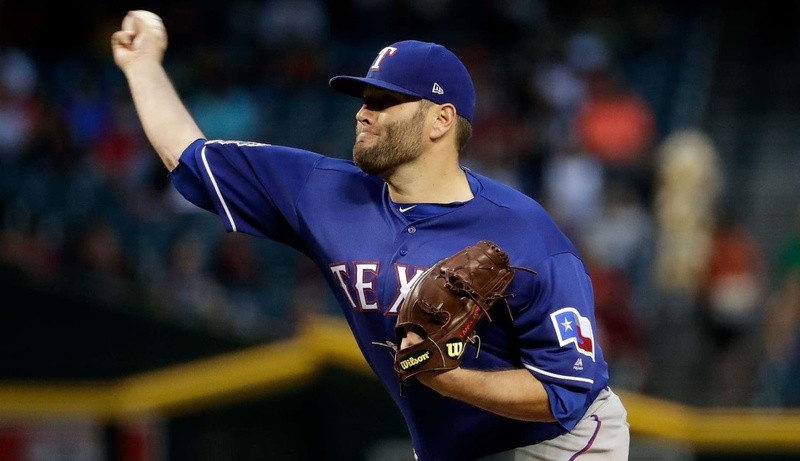 Knowing the Rangers should be looking for pitching depth, I stopped by MLB Trade Rumors for a peek. Discovered the Yankees are shutting down Severino for 6 weeks and also looking for an arm. When asked about Keuchel, the answer was not unless he drops his asking price a lot more. If the Yankees don’t want to pay what he wants, what are the odds anybody wants to. I’ve slowly come to the same conclusion. Say goodbye to the draft pick and slot money. Then go ahead spend the owners money, they can afford it. If nothing else it would be a huge PR win. Good morning all! Here are the pics from yesterday’s game. Refresh. Have a great day! Go, I think MAYBE the reason pictures have become so scarce is MLB has a new policy that limits what and how many high lights the club’s can post. I don’t know if it is affecting the number of pictures available or not, but something is. I don’t know, but the pics from Twitter used to be very clear, and now they are pretty blurry. They aren’t very good but that is all they are putting out. They may need a new photographer. Or maybe they let go of the experienced photographers they had and hired cheaper inexperienced photographers to save money? From the box score it looks like the Rangers forgot the patient approach to hitting with Ks accounting for over half their outs. except for Gallo, and Odor, everyone taking way too many pitches………then swinging at a ball out of their zone……. I view this whole thing with a huge huge grain of salt. These guys got to where they are by being a certain type of hitter. Most have been in the league three or four years, or more. This isn’t the first time they have heard to be patient, to go the other way, to work a count, all those things. Not sure why this time would be the charm when others weren’t. Seemed like empty wishing to me. But, that’s about all we have. Bud Norris is still out there and would fit into the Rangers usual price range for a warm body. Other than Kuechel, the FA pitching list is pretty thin. Every one of those guys would be an upgrade over Smyly and Miller. There is not much out there for starting pitching. JD could swing a deal or two for some team’s AAA depth that would not cost too much. It just don’t look good for the home team on the pitching front. Losing Mendez, Volquez, Farrell and Hammel put a dent in who they could throw out there. This seems to happen every year. I remember in the past five seasons on two different occasions where Daniels has admired he left the team “exposed.” Right, you cannot predict those injuries. But we’re not talking about prime talent being lost. Hammel, at least, has some skins on the wall. And I reckon Jurado is already spoken for because if Sampson stays in the rotation then there is no one for long relief. Though they could try to skate by just revolving door the pitching that is burnt, back to Nashvile if they burn them when some starter has a short outing. And so then, you think they will replace Sampson with Jurado in the rotation? I don’t think Hearn is quite ready yet. Yes, his line was good his last time out, but it was a “Lucky” good. I’m not sure, but I think Sampson can fill Edinsons spot, and then there’s Jurado which I don’t think should be a full time guy either. Once in awhile o.k. but not every fifth day. I’m about ready to say to heck with the draft pick and slot money just sign Keuchel. Waste some of the owners money. I agree Hearn is not ready but if they don’t sign someone then Hearn will be thrown out there, sooner than later. They don’t have a legit long man on the 25 man at this time. That’s why I’ve joined the “sign Keuchel” crowd. I hate it, but it looks like the best solution at this point. I hear ya. Would hate to give up the pick, but things are looking bleak. I put a new not water heater in this morning, I have to go clean up the rubble I left in the garage. Talk to you all later. I wouldn’t hate to give up the pick for one reason. The Rangers haven’t shown much of ability to do anything with those picks. At least with Keuchel you know what you are getting. I am still in the VERY NO camp………. The whole focus now is developing the picks. I like what they have going in A and A+. Several more starting there this year. Palumbo has the most potential to be a surprise. The kid is super focused on baseball. He eats, sleeps and thinks of nothing else. Included girls. Said he’s a ball player, not interested in chasing girls. Incidently he’s had a nickname change. Have picked up on it yet, but he’s got a new one. The top two picks from 2018 will get their first smell of action this year in Spokane. Cole Winn and Owen White. Anything for Kuechel over 65mil for 3 years would be throwing money in the toilet. 3 years would be the max. That is why he is still sitting out there waiting. Never found the game on TV last night. Glad we won! Since the Stars made the playoffs Rangers games are being moved. Where? I checked all the likely places and came up empty. Oh, I wondered why they weren’t on normal channels. That’s ridiculous. Chris Davis has not gone hitless in his last 61 plate appearances. He has three seasons, after this, left on his contract. They couldn’t afford to keep Machado because of the money they gave Davis. He has stuck it out a lot longer than I would have. If I were Chris Davis, I’d take the money, buy Longview, and live happily ever after. Right now, my biggest concern is LeClerc. Normally I wouldn’t worry too much about two bad games out of a closer. But this is LeClerc the guy that up until last year had just horrible control. Right up there with Sadzeck bad, actually worse at times. Can he regain his command again, or has his past resurfaced and going to haunt him. I hope he can fix whatever ails him, or his contract could become another albatross. That is a real concern. I’d forgotten his wildness problems before. His 97 mph fastball is not fast enough. We know the young pitchers we have been hearing about that are performing well throughout the system at this time. The Ranger have several high draft picks that will be getting back into action now or this winter after having had surgeries. Guys that we have not talked much about. Kyle Cody, who was minor league pitcher of the year in 2017 will be getting back to activities later this year. This is another influx into the lower farm system. Hans Crouse is the guy bro. He’s going to be good right away. I have been following Crouse. He has a ways to go but should be at Down East at some point this year. If he gets his change up to the point where it’s average or better, hel’ll probably skip a step and go directly to AA. His FB and SL are already plus and ML ready. His mechanics look weird and out of wack, but when you listen to BB people they tell you that everything is where is supposed to be when it’s supposed to be there. I wouldn’t know, I can’t tell. Mariners win again 13-2 great start that’s what I call an excellent rebuild. What did it take 6 months Jd should take lessons. They got rid of their 3 best players……don’t think they will maintain the best MLB record but it has been a great start. Didn’t look at the box score but they have hit a HR in every game so far. It has been a nice run, But, I seriously doubt that they will hit .294 as a team for much longer. The eight runs a game bubble is going to burst at some point. It’s just not sustainable. Nice to have it while it lasts though. Yes a lot of baseball left, no there not going to keep this up but neither was the 69 Mets. If they play like this for about 3 more weeks then just play 500 ball the rest of the season should be chasing a wc. ← When the plan doesn’t go as planned.